I once had this wonderful "botequim" dish in a restaurant called Doce Delícia in Ipanema. Try it with Brazilian rice, farofa and mandioca frita. Or, with just rice and a poached egg. Simple and delicious. (This is my version of the recipe.) 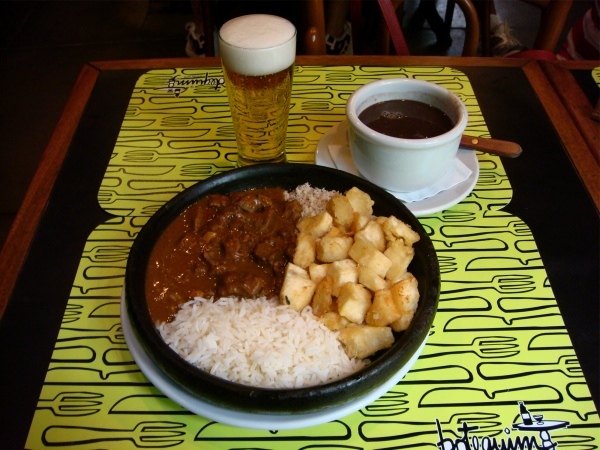 The photograph above is of a traditional picadinho (minus the corn) with rice, mandioca frita, farofa, and caldinho de feijão (soupy black beans), served with a very cold "chopinho" (draft beer). 1 Tbsp of tomato paste, optional (tip: buy the Italian tubes of tomato paste because they will last longer and will not spoil). Sauté onion and garlic until limp. Add beef and brown. Add tomato paste (if you want to use it) and a little water to make a bit of juice. Cook for a few minutes to have a nice sauce. Add corn and salt and pepper to taste.